The U.S. has added about 650,000 factory jobs since their numbers rebounded after the recession, putting manufacturing workers at 12.1 million and reversing a long decline in such jobs, reports The Wall Street Journal (May 30, 2014). But uneven growth has created regional disparities in the nation’s overall economic recovery. Mobile, Alabama is among the winners. Shipbuilder Austral Ltd.’s facility here is busy seven days a week as workers piece together enormous aluminum sheets in a space the size of 13 football fields. Airbus and BAE Systems, too, are adding factory jobs here. Mobile created more manufacturing jobs than all but 15 U.S. counties in the past 4 years. U.S. factory-job gains—driven by a range of factors from cheaper domestic energy to the auto-industry recovery—have concentrated in pockets since the recession, particularly in the Southeast and Midwest. 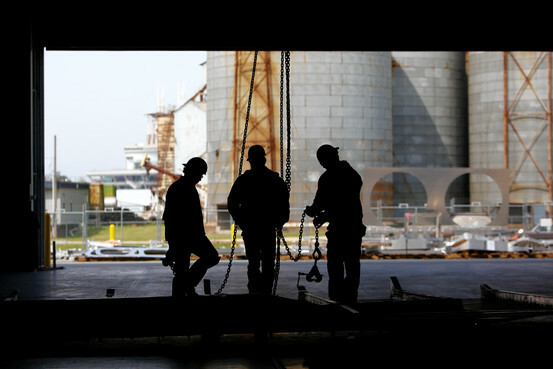 Mobile’s success illustrates some common patterns: Often, companies have added jobs in states with “right-to-work” laws—which allow workers in unionized workplaces to opt out of paying union dues—and where taxes are relatively low, in counties where governments provide large incentives and strong vocational education, and in places with access to ports or other transport hubs. Austal chose Mobile because of location, waterfront property, cooperative local and state governments, low taxes and low union membership. Alabama’s government sponsored training for Austal workers and built it a $12 million training center.